Organizations today are facing unprecedented challenges, including an ageing workforce, potential talent shortages, an increasingly competitive international environment and the need to utilize the talents of the best qualified people, regardless of gender. More women than men, in many cases, are graduating from universities and gaining the requisite experience to qualify for advancement to higher levels of management. In this expanded and revised third edition, Professors Burke and Richardsen, together with a list of international contributors, address women’s progression in the workforce and into the upper echelons of management. They cover a range of professions and a geographically dispersed territory, thereby advancing the understanding of women in management within a traditional context, and making a substantial contribution to the literature for both an academic and practitioner audience. The broader regional perspective offers a comprehensive overview of the challenges and opportunities facing women in the workplace, and promotes the ongoing analysis of the interface between women's career aspirations and societal and organizational norms, assumptions and values. Following the same format as the previous edition, the country by country analysis allows for the data between countries and regions to be compared, for the differences to be addressed and a more holistic picture of the situation in a given country to be assessed. 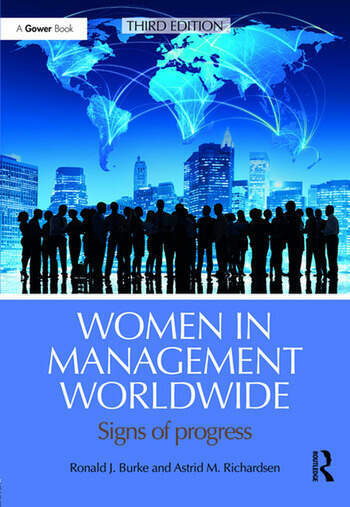 Women in Management Worldwide will appeal to researchers, policy-makers in a range of countries interested in workforce issues, talent management and gender equality, as well as consultants working with international organizations on HRM and organizational effectiveness challenges. Ronald J. Burke is an Emeritus Professor of Organizational Studies at the Schulich School of Business, York University, Canada. Astrid M. Richardsen is Professor of Organization Psychology at BI Norwegian Business School, Norway.